Quality lodging 200m near te slopes: This lodging is located in the recently built building "Edificio Alpes" in the upper zone of Pradollano. From here you enjoy wondeful views towards the slopes, the valley of Pradollano and the mountains of the Sierra Nevada. After a 200 m walk you are by the slopes and the chair lift "Telesilla Pardaor". The quality equippment of the lodging guarantees a comfortable stay. There are 2 bedrooms, one provides a double bed and the other 2 single beds (one trundle bed - see photo). In the living room you find a comfortable sofa-bed, where sleeps the fifth person. The American kitchen is combined with the living room. All the furniture and equipment is as new and in good conditions. A private garage is included, where you can store as well your ski equipment. To the restaurants and shops and Internet places it takes just a 5-10 min walk. You don't have to walk all the street down. There is a small way between the buildings, that is much faster. As well yoiu can take the shuttle bus circle line to get to the central lower zone or the mid zone. 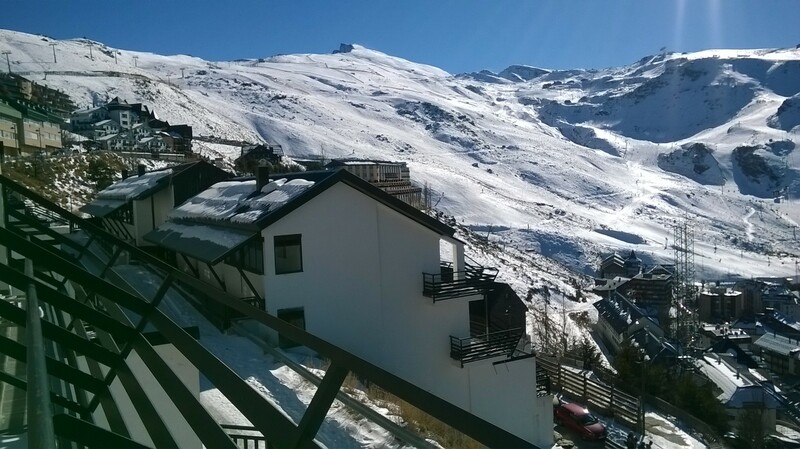 If you are looking for a comfortable quality lodging for your ski vacations in vacations in Sierra Nevada, this place is fine for you.